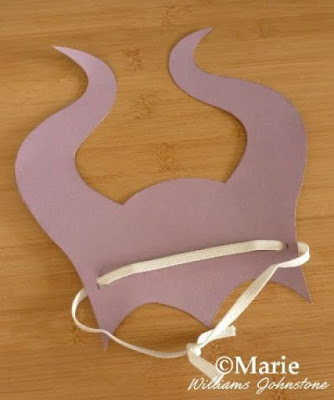 There are various ways of making horns to dress up as the character Maleficent. This is one of the quickest and easiest ways to make your own DIY headpiece from paper or card. 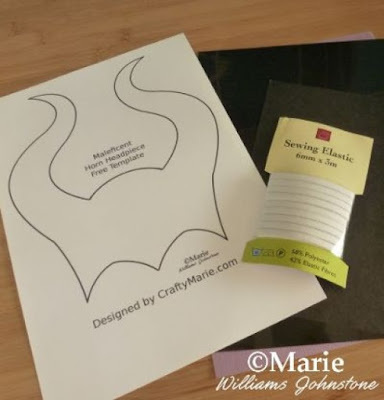 This easy Maleficent horn mask is perfect for kids who want to wear a costume for Halloween and it's great as a last minute make that you can do since I also have the free template for you to print out here on JustHalloweenCrafts as well. Come and see how to make up this easy elasticated mask headpiece right now. 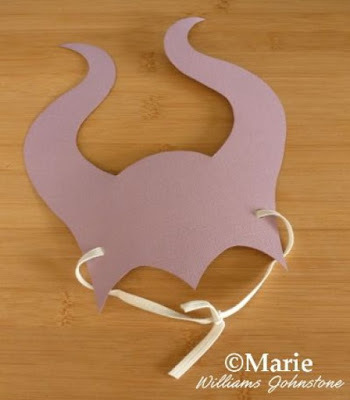 It is very quick and easy to make with the free printable horns design. You can make this in minutes for a fast costume accessory. 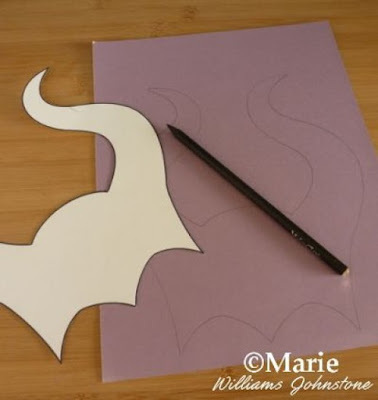 Step 1: The link to your free, printable horns template is listed above under what you need. Or you may just want to draw your own design instead. Maleficent's headpiece does look best in black. It's the color choice for evil villains and it's the color she wears in the latest movie. However, you could also make this in purple or a combination of purple and black which would work better for the older animated Sleeping Beauty. Alternatively, be totally different and pick a monster lime green or more of a devilish bright red instead. Why not. Step 2: Print out the template onto some thick card. You can just print directly onto a color like purple and then cut the horns out which is a lot faster. However, this doesn't work if you want a pair of black horns to match up with how the new evil fairy queen looks as played by Angelina Jolie - the black ink won't show on the black cardstock. In this case, print the template onto a lighter shade of thick card like white or cream. Cut it out and then trace around it onto black or very dark card with a white (or a very light) color pencil. That way, you can see the pencil marks for where you need to cut on the lines. Cut out your horns. Step 3: Use a hole punch to make a couple of holes in the paper mask as shown in the photo. You need one hole punched on either side of the mask. Roughly measure out a piece of elasticated tape which is large enough to fit around the head with extra elastic for tying or knotting closed. Place the front of the headpiece down on a work surface right in front of you and make sure it is upright. Thread the piece of elastic through as follows. Start from the right hand side, lift up this side to push the elastic tape up from the bottom and through the punched hole. Pull the tape across the back of the mask and through the hole on the left side. Adjust the tape until both sides are roughly the same length. Step 4: Now try the mask or headpiece around the head and tie a secure knot at the back in the elastic to secure it in place. You can cut off extra lengths of elastic as required to tidy it up at the back. Now the Maleficent headpiece can be quickly put on and off as needed. So fast and easy to make. You can make up lots of these in a hurry if needed for a party or a group of kids. 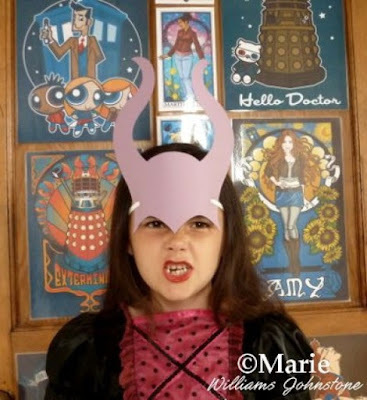 My daughter's demonstrating her purple horns below with her best evil face impression. My little girl loves dressing up as this character. She's seen the Disney movie and it's one of her favorites to watch. I hope you've enjoyed reading my justhalloweencrafts page today, thanks for your visit. Let me know how this make goes for you in the comments below.